Let me just start by saying, I will never pretend to be a True Cowgirl. cow·girl n. A hired woman, especially in the western United States, who tends cattle and performs many of her duties on horseback. I love the life, the lifestyle and am incredibly appreciative of the opportunity to do more things considered Cowgirl since meeting the Cowboy. But despite the fact I’ve worn cowboy boots since earning enough to buy my first pair as a teen, love country music and all it stands for and have always wanted to live at the end of a dirt road .. I’ve never called myself a cowgirl and know it’ll take awhile to earn the stripes associated with the title, if ever. Especially after the events of this week. We have worked a lot around the Cowboy’s ranch this week. Learning the flag race ..
And unfortunately for me .. I also rode this week, into a barrel. It’s happened only once out of all the runs we’ve ever taken. But I took a pretty good chunk of skin out of my shin. Anyway, days later the leg still smarts. But not as much as it did before. Because I now have a few new aches and pains to help take my mind off a sore leg. We no more than got Ol Joe saddled up yesterday (the Cowboy’s roping horse, who I have been riding all week and every time we’ve been to the ranch), and into the arena with the girls on their horses .. But I ended up on the ground. While I have prepared mentally for that moment for years .. until it happens, I’m pretty sure you can’t really appreciate how little control you have over how you fall. Unless like bronc riders for instance, you practice .. A LOT. Regardless, it was the first time I’ve ever been thrown. And as I lay there in the dirt having hit my tailbone a couple times on the saddle and then my head on the ground after bracing the fall with my arm .. I assessed just what really hurt. And then the thoughts creeped in .. that a true cowgirl both would know how to ride through something like that .. and that she would also probably get up faster than I was. I hear crying over to my left ..
I’m still laying there. “I’m fine,” I say. 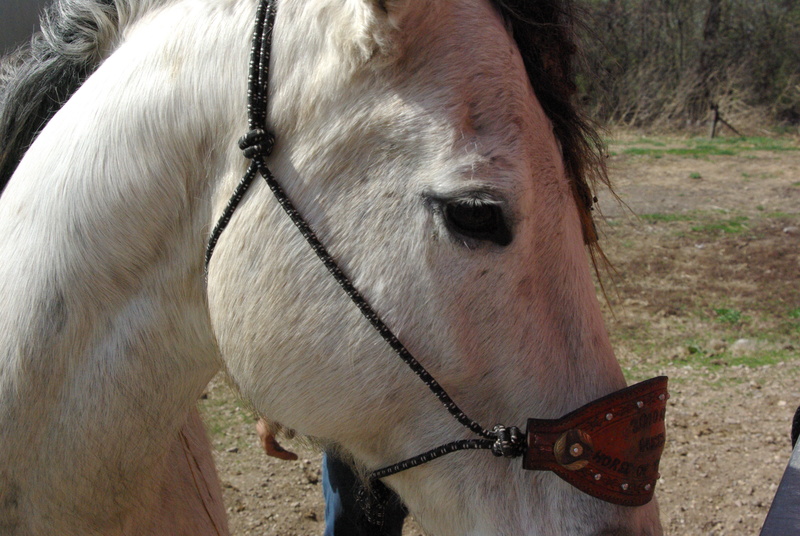 The girls, both now standing nearby on their own horses, were upset and worried. I start laughing to reassure them that I am, or will be shortly, just fine. I’m still laying in the dirt. I laugh some more. And think, that’s about how my own mother would have handled it. Laugh through the pain. I got up .. slowly. Dusted myself off. And went to help them get Ol Joe back into the arena. The Cowboy rode him for a few minutes. And then I got back on. I wasn’t sure my body was ready for it. But the Cowboy made me. Which in hindsight, I appreciate. 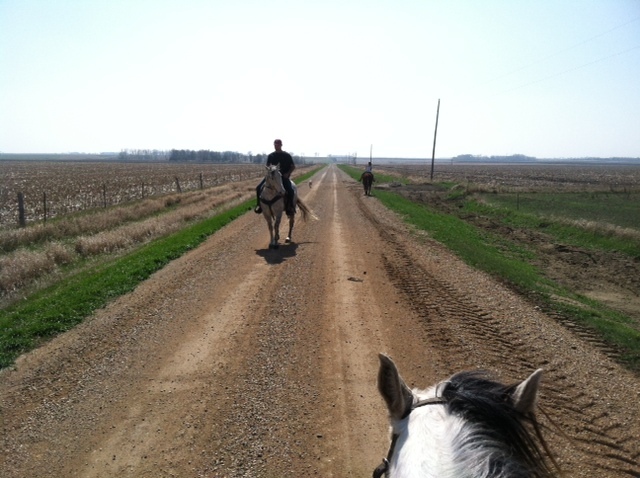 “You haven’t ridden enough if you haven’t been bucked off at least once,” the Cowboy tells me. So .. this was a good thing, I guess. I may not be a true cowgirl. But I’m on my way perhaps to better understanding what it takes to be one ..
And as we talk this morning about saddling Joe and the other horses back up ..
I’m enjoying every painful step of walking around, getting ready to head back out again, to ride. 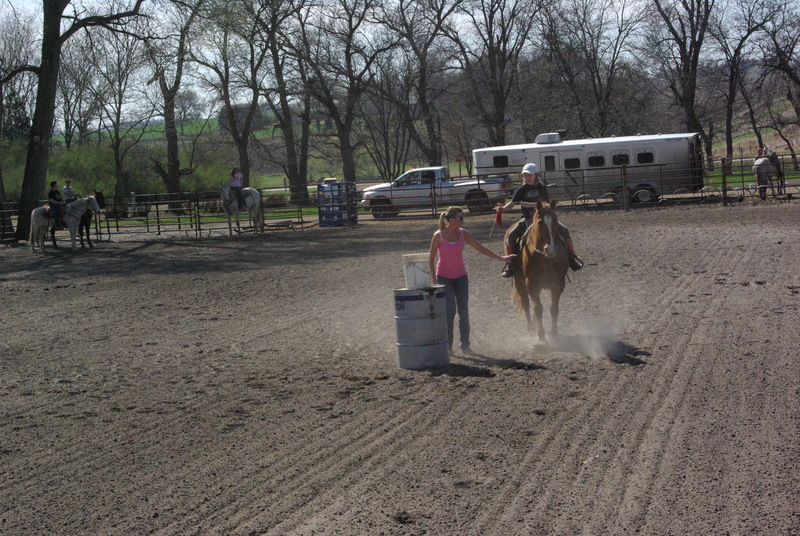 This entry was posted in Bucking Horse, Children, Cowboy, Cowgirl, Horseback Riding, Life, Lifestyle, Pain, Rodeo, South Dakota, Uncategorized, Wisconsin and tagged Barrel racing, Bucking Horse, Cowboy, Cowgirl, Falling off a horse, Family, Healing, Horseback riding, Horses, Humor, Life, LIfestyle, South Dakota, Wisconsin by Carleen Wild. Bookmark the permalink. These memories are something you will always cherish. I know. Judy, you sweetheart, thank you for the reblog! I’m not sure how that all works .. but I sincerely appreciate it, that you follow my writing, think enough of it to stop in to read and not only that, to share. Much appreciated .. wish you the best! And I’m stopping by to check out your writing tonight as I have some unexpected down time, home sick from work. 🙂 Not something I usually smile about. But trying to get caught up on some things I don’t usually have/make time for. Best to you .. Sounds to me like you are well on your way. I lived in NM for 12 years and I became a trail rider but never made it to cowgirl. Hit the dirt the first time I ever took Quincy on the trail. and the 2nd and the 3rd. The cowboys and cowgirls told me to sell him….couldn’t do it. Maybe one has to be born a cowgirl!! I’m amazed at how much having the right horse makes a difference in how good a rider you can be .. The Cowboy says he sees many women (myself included) get too attached to their horses and just want them to love more than they want them to ride. We are working on both my riding and my own horse because I don’t want to give her up .. but we should be much further along than we are at this point, in the process. She’s an awesome horse. I just haven’t had the time or know-how to train her myself, the finances to have someone else work with her the way I’ve needed nor the heart to let her go. It’s funny though, she used to come to me whenever I simply pulled up to the barn and called. She now tries to act like she doesn’t see me there because we are finally working with her – hard. And it’s paying off. 🙂 Good luck to you and Quincy and happy, safe riding! Good job, once you get thrown a few times you’ll learn how to stick um! I’ve seen girls who call themselfs “cowgirls” get piled and not get back on. It happens to the best of us. Last time I had my gelding in the arena he set his front feet and I littlerly just fell off. Quite the laugh we had about it, over and over, my husband caught it on video. Keep up the good work, love your blogs. Lisha, thanks for your note and for your time to read some of my writing .. days later now and even at the time I can fully appreciate the fall! I am however, glad no one got mine on video! You’re a strong woman to not find that and erase it when no one is looking! 😉 I’m looking forward to always getting back on that horse. And learning the stick um. The Cowboy can handle just about anything a horse will try do to throw him .. its fun and pretty amazing to watch.